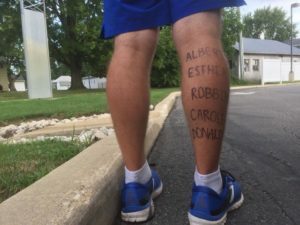 “In the last few days since finishing the run, I have been asked time and time again, “How in the world did you do it?”And every time I responded, “because I was doing it for the people on the back of my leg”. Each day of the run, I dedicated the day’s miles in honor of countless different cancer survivors, and in memory of even more who weren’t so lucky. These names were all written in sharpie on the back of my calf, so that when a run got a little too difficult I always had something to look back at for some inspiration. I feel as though I was able to make my greatest impact on this adventure by running for all of these people. The most difficult thing that I never could have prepared for this summer was learning the stories of so many friends and family members who I never even knew were affected. 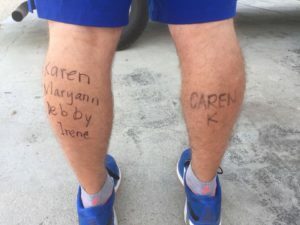 But to be able to see the impact I had on their loved ones simply by writing a name on my leg left me in awe. Special thanks to Sam Snyder, runner on Team Boston 2018, for sharing how his why impacted his 4K experience and motivated him along the way.